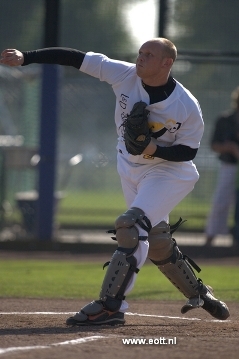 The Dutch Honkbalsite has handed out the awards for the 2008 season in the Hoofdklasse. The readers of this website voted for the Netherlands Baseball All-Star Team and the MVP of this season. The selection is headed by catcher Sidney De Jong of national champion L&D AMSTERDAM, who succeeds teammate Fausto Alvarez as Most Valuable Player. Sidney de Jong (L&D AMSTERDAM PIRATES): He batted .360 (OBP .489/SLG .581) with six homeruns, 38 runs scored and 28 RBIs during the regular season. As a catcher he threw out nine of 29 potential base stealers. He made just two errors in 27 games and had no passed ball, sitting behind the plate. Diegomar Markwell (DOOR NEPTUNUS ROTTERDAM): The southpaw posted a 9-5 record with an ERA of 2.37 in 15 starts for the semi-finalist in 2008. He struck out 51 in 91 innings pitched, while walking 32. Rob Cordemans (SPARTA/FEYENOORD ROTTERDAM): He had a perfect 9-0 record with an ERA of 0.86 in 15 games for the fifth-place finisher. He had 112 strikeouts in 94 1/3 innings, while only allowing 53 hits, eleven runs (9 ER) and 16 walks. Percy Isenia (SPARTA/FEYENOORD ROTTERDAM): The 31-year-old batted .304 (.367/.432) with two homeruns, 13 doubles, 19 runs scored and 29 RBIs in 41 games. Benjamin Dille (DOOR NEPTUNUS ROTTERDAM): The 22-year-old member of the Belgian National Team had a batting average of .317 (.437/.379) with four doubles, three triples, 36 runs scored and 19 RBIs in 42 games. Vince Rooi (CORENDON KINHEIM HAARLEM): The former minor leaguer batted .297 (.384/.439) with two homeruns, a triple, 13 doubles, 23 runs scored and 32 RBIs in 40 games for the European Cup Champion of Grosseto. Michael Duursma (KONICA MINOLTA PIONIERS HOOFDDORP): The 30-year-old batted .279 (.419/.346) with seven doubles, a triple, 34 runs scored and 16 RBIs in 38 games for the semi-finalist. Wesley Connor (L&D AMSTERDAM PIRATES): The number 31 of the national champion batted .314 (.359/.442) with four homeruns, a triple, six doubles, 33 runs scored and 13 RBIs in 36 games. Danny Rombley (CORENDON KINHEIM HAARLEM): He hit .333 (.417/.438) with a homerun, two triples, eight doubles, 35 runs scored and 19 RBIs in 2008. Dirk van’t Klooster (CORENDON KINHEIM HAARLEM): The longtime member of the Dutch National Team batted .331 (.392/.368) with five doubles, 23 runs scored and 14 RBIs in 34 games. Fausto Alvarez Rizo (L&D AMSTERDAM PIRATES): The 47-year-old Cuban veteran and 2007 MVP batted .296 (.347/.454) with five homeruns, nine doubles, 23 runs scored and 31 RBIs, winning his first championship in Holland.